Del Brown with a 32-pound permit caught on a cloudy, windy, rainy day when most of the other anglers stayed at the dock. Marshall Cutchin photo. ASK ANY TOP FLY-FISHING GUIDE to give you a short list of his best tips for catching permit, and you will receive a handful of suggestions that are applicable almost anywhere in shallow salt water. “Watch the fish” is likely to be key advice. So is, “Know where your fly line is at all times.” The fact is, most permit guides want you to do the same things you do when fishing for tarpon or bonefish — only better. Part of the reason, of course, is that the stakes are higher. A client l once “inherited” from other guides who had failed to put him on fish told me that it cost him exactly $9,957 to catch his first permit. For most of us, that is meaningful. It certainly was to me. During more than 12 years of guiding in Key West, I watched fly fishermen make more mistakes on permit than on any other species, perhaps because there are more mistakes to make with this finicky and often exasperating fish. From that, I’ve developed a sort of Top 10 list of the essential skills, techniques, and tactics necessary to pursue permit. Starting with the least-critical dos and don’ts and graduating to the tips that will make the greatest difference in your permit fishing, these suggestions are also increasingly difficult to master. Learning not to stand on your fly line when a fish runs usually takes only one hard lesson. Figuring out how to set the hook on a permit can take a lifetime. But it is always best to know how deep the water is before you wade in. And taking the time to ingrain the following principles into your approach may mean the difference between having to swallow a bitter pill on your flight home and savoring the sweet taste of success after catching a most difficult fish in a most beautiful place. … and be sure you are holding it. Sure, you can keep a fully rigged permit rod in the gunwale rack for the occasional stray fish that interrupts your tarpon fishing, but when you see a permit, you will want to keep your eyes solely on that fish. They are quite difficult to see, especially for the inexperienced. So, if you want to catch a permit, stand on the bow with a permit rod in hand. Although these fish can weigh up to 50 pounds, line and rod weight are determined as much by the need to calmly deliver heavy flies — often in a stiff wind — as they are by the size of the fish. The standard is a 10-weight rod with a weight-forward floating line. Some anglers feel the need to overload with an 11-weight line to help turn over bulky permit flies, and many prefer to use a saltwater taper, which has more of its belly weight toward the tip. 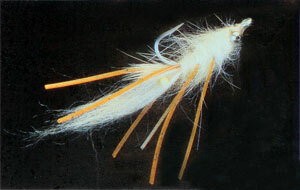 Heavily weighted crab flies are the go-to pattern in water of less than about five feet, when permit are more likely to respond to the defensive behavior of the prey's tendency to hide on the bottom. Ideally, your cast should place the fly in such a spot that the fish first sees it as it sinks through the water column. 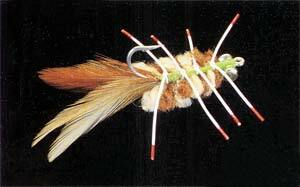 Merkin tied by Marshall Cutchin. David Klausmeyer photo. But in any case, once you figure out the best rod and line combination, learn to tie solid knots — and test them. A pigtail at the end of a leader section where a knot has just failed has sent many good anglers into a downward spiral of self-defeat. And finally, make sure you don’t get sunscreen on the fly line, leader, or fly. Permit have highly developed sense of smell, which they use to every advantage. Many anglers catch it their first permit while tarpon fishing or, say, after stepping down to take a bite of sandwich and suddenly spotting the glint of a tailing fish. You might even see a fish upon first approaching the flat, so be on the bow and ready to cast before the boat even gets into position. And when leaving, don’t reel up a before the skiff’s motor is going down. Many times, you might be stalking permit in two feet of water and notice, as you are about to leave, that there are fish hanging on the edge of the adjacent channel. Permit can appear seemingly out of nowhere. On windy days and in off-color water, for example, fish that normally wouldn’t come to within 50 feet of the boat might suddenly swim right under the bow. Be ready to take advantage of any opportunity, no matter how unorthodox. Most casting instructors will tell you to open up your loop when throwing oversize or heavy flies. The technique, sometimes described as “chuck and duck,” keeps the fly from abruptly bouncing at the end of the backcast and actually increases your awareness of where the fly is (which is doubly important when you think about the potential impact of lead eyes against the back of your head). Worry less about picture-perfect casting form and more about delivering the fly on short notice, no matter what the wind direction. If a sinking fly does not work, stripping flies that imitate small shrimps may prove more productive. A stripped fly can be especially effective in super calm conditions or when fish are in water deeper than about five to eight feet and are therefore expecting to see their prey flee on the surface. David Klausmeyer photo. Be ready to change your strategy to fit the situation. Just when you have perfected a technique for catching permit, they will change their behavior and leave you whimpering. Although there is nothing like having a few permit under your belt to calm your nerves and increase your confidence, anglers who find early success with one technique can get shut out when conditions change. Don’t fixate on a specific strip length, or the supposedly best tide and wind direction, or what your buddy told you after catching four three-pound permit in Belize last year. One of the best tips for all kinds of saltwater fly fishing is “Be there and be square.” Proper tackle, well-tied knots, sharp hooks, line management, and all the other mechanics of the sport constitute being “square.” Being “there” simply means showing up on the flat and keeping your mind on the here and now. … and work as hard as he does. The best guides will have seen a lot of fish caught on flies and know instinctively when the fish has taken the fly and when it has refused. They typically will see the fish long before you do and can tell you how it is behaving, which is critical. Beyond these core skills, effective guiding for permit takes serious physical effort that usually entails covering large amounts of territory both by motor and pushpole. You’ll know you are really permit fishing when you’re casting into a 15-knot wind at the end of the day. But before you decide it isn’t worth the effort, remember that your guide has been pushing an 800-pound boat and 400 pounds of people around in the same wind for the past eight hours. In Key West, for example, the prevailing southeasterly wind means you are poling into a blow the last few hours of every day in order to keep the setting sun at your back. If the guide is still pushing you upwind, it’s because he thinks you can still catch fish. Be sure you put out an equal effort on the bow. Permit are not harder to see than other fish; they are just different. Standard advice is to look for the darkest part of the fish — their coal-black, forked tails. This is especially true when trying to spot smaller permit. But the longer you pursue permit, the more you will begin to look for the whole fish. Permit are generally larger than bonefish; yet they typically frequent darker-bottom flats and don’t cast a telltale shadow as often. Head-on, however, the dark band that runs down their back from just behind their head to their tail is a dead giveaway. This is why a permit can seem to suddenly appear and then disappear as he first turns toward and then sideways to the angler. Also, despite previously published claims to the contrary, permit do in fact mud, and their muds are especially visible when they hold in current on dark, grassy bottoms or move across the current on a favorite flat, leaving short “smoke trails” each time they dig into the bottom. Although you normally want a permit to first see a weighted fly as it sinks to the bottom, you sometimes may have to strip the fly until the fish notices it, especially if your cast lands a little too far away. But you’ll be amazed at how many fish will still see the fly drop from 10 or 15 feet away. If the fly is close to the fish and it still fails to notice it, give the fly a very short strip, and then pause again. If the permit swims off because it seems mildly irritated or just uninterested, wait for him to get 10 feet away, then strip out and pick up the fly, and cast again. There are worse ways to spend your time than repeatedly throwing at a seemingly disinterested permit. Many times I have seen anglers make more than a dozen casts to me same fish before it finally took the fly. Keep in mind that a permit that does not leave the flat after seeing your fly once or twice is staying for only one reason: to eat. Learning when to set the hook by feeling for the fish is a technique that is almost essential to permit fishing, although it is often useful with bonefish and other species as well. Always try to find out whether the fish has eaten the fly by removing the slack and feeling the tension in your stripping hand before lifting the rod tip — unless of course, you hear your guide yell, “He ate it!” Once you’ve decided the fish has eaten, you want to quickly and smoothly bring the fly line tight. There are many reasons for not swiftly lifting your rod tip or yanking back hard on the line, but the number one reason is that you want the fly to remain in the fish’s “cone of interest.” If the fish is still examining the fly, you want to avoid imparting any unexpected movement to it, just in case the fish does not have it in his mouth. Secondly, the interior of a permit’s mouth is not soft, but it is rubbery. 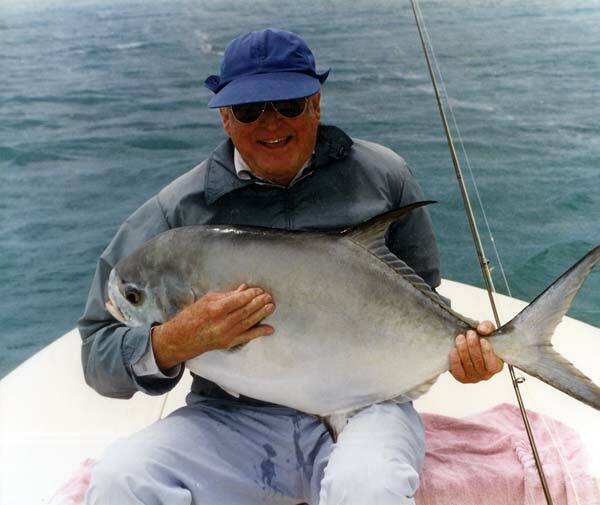 A permit running with a fly after the take will generally set the hook himself, and snatching the fly too early in the sequence risks yanking it out of the fish’s mouth or getting a poor hook placement. This is the most difficult aspect of fly fishing for permit, and the most important. Permit are generally slower and more deliberate than either tarpon or bonefish. Yes, they will attack a fly like a starving jack in certain circumstances. But permit normally examine their prey more carefully than other fish do, and waiting for a permit to make a decision about your fly can be agonizing compared with the quick response typically required to hook redfish or bones. Inexperienced permit anglers often err by lifting the rod or striking hard as soon as a permit starts to tip up on a fly. Again, this causes the fly to move when the fish least expects it, probably spooking him. In addition to becoming a student of the species in general, learn to recognize the pace at which any individual permit is feeding, and make note of the variations in behavior that are determined by the immediate environment. For example, a fast-moving permit coming head on — even if it is stopping at regular intervals — usually gives you only one chance to make your cast, and you want your fly to land in front of the fish and within its field of vision. A tailing or mudding fish often requires that the fly land very close to its head because it is looking down and may be surrounded by a cloud of silt. A fish hanging on the edge of a channel in eight feet of water is not expecting a fly to drop at all, so strip it erratically to keep his interest. And all three situations are different from a line of fish cruising across a sea-grass flat, where throwing closer to the fish than normal is necessary just to keep the fly from disappearing in the grass. Remember, they all will eat, but each requires a different presentation of the fly, and that is something best learned by spending plenty of time on the water.